(New Britain, Conn., Apr. 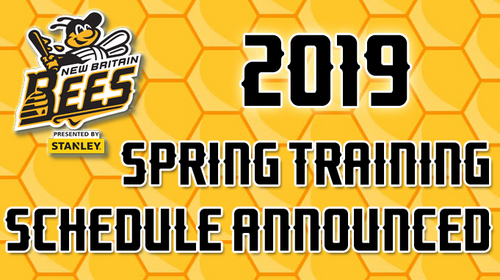 10, 2019) – The New Britain Bees have announced dates and starting times for their 2019 Spring Training schedule. The Bees will hold Spring Training at New Britain Stadium for the 2019 season. The Bees Spring Training schedule will include two exhibition games, one against the CT Twilight League, and another against the Milford Hunters. Two of those games will be held at New Britain Stadium. Any Bees fan who would like to get a sneak peek of their hometown team before the regular season begins is welcome to attend. General admission tickets will be complimentary for any home Spring Training games. Food and beverage will be available for purchase at New Britain Stadium during each game. No outside food or beverage will be allowed inside the ballpark. The New Britain Elks Lodge will also host a special “Meet the Players” Dinner on Tuesday, April 23rd. The event starts at 5:00pm with a player meet and greet, followed by a social hour at 6:00pm, then dinner is served at 7:00pm. Tickets can be purchased in advance by visiting New Britain Stadium or the New Britain Elks Lodge. The New Britain Elks Lodge is located at 30 Washington St., New Britain, CT 06051.